Satya Lokam is a Senior Researcher at the Microsoft Research lab in Bangalore, India. His research interests include Cryptography, Complexity Theory, and Theoretical Computer Science in general. Before moving to Microsoft Research, Satya was a faculty member at the University of Michigan, Ann Arbor. He received his Ph.D. from the University of Chicago and held postdoctoral positions at the University of Toronto and at the Institute for Advanced Study (IAS) in Princeton, NJ. PC member: BlockSEA 2018 (The 1st Workshop on Blockchain and Sharing Economy Applications), Workshop in ICDM 2018, Singapore. PC Co-Chair: Blockchains, Cryptocurrencies, and Contracts (BCC 2018), Workshop in AsiaCCS 2018, S. Korea. PC Co-Chair: Blockchains, Cryptocurrencies, and Contracts (BCC 2017), Workshop in AsiaCCS 2017, Abu Dhabi. 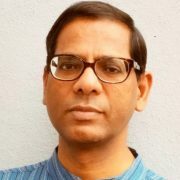 PC Co-Chair, Foundations of Software Technology and Theoretical Computer Science (FSTTCS 2017), Kanpur, India. PC Member: International Colloquium on Automata, Languages, and Programming (ICALP 2016), Rome, Italy. General Co-Chair: Indocrypt 2015, Bangalore, India. General Co-Chair: Asiacrypt 2013, Bangalore, India.